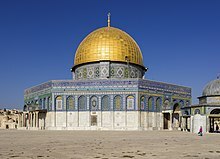 The Dome o the Rock (Arabic: قبة الصخرة‎, translit. : Qubbat As-Sakhrah, Ebreu: כיפת הסלע‎‎, translit. : Kipat Hasela) is a shrine locatit on the Temple Moont in the Auld Ceety o Jerusalem. This page wis last eeditit on 26 Februar 2019, at 06:29.